What an intense weather week! Snowstorms in Wisconsin, flooding here in Ohio, and horrendous tornadoes in the southeast. 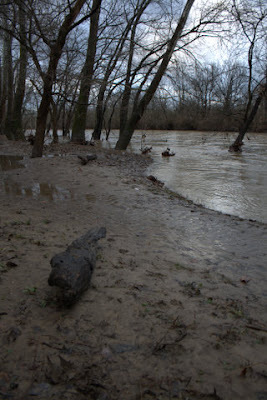 The Olentangy River, about a quarter mile from my front door, rose several feet, but did not overflow its banks. The same thing can not be said about the Blanchard River near Findlay, Ohio, which has flooded for the second time in less than a year. Last night, I walked down to the Olentangy to see what the floods had brought, and I must say, I wasn't ready for this. I really thought an old fishing lure had washed up on shore. It had not. 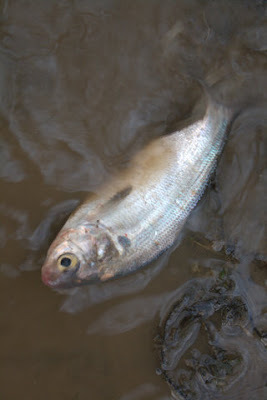 This was a real fish, a recently alive gizzard shad (Dorosoma cepedianum). It had been washed onto the shore by high water. This shad is not an adult, it was only about two inches long. 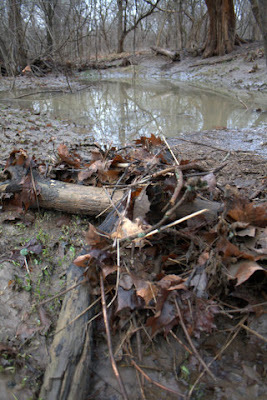 As I walked along my usual path, I was beginning to realize that he whole river bank was a mess. Logs, trash, and debris were everywhere. So were more gizzard shad. 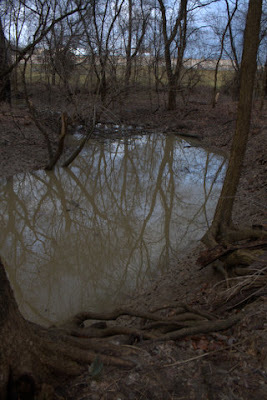 I noticed a flicker and ripple in several mud puddles. The ripples also turned out to be gizzard shad. This time, they were alive. I corralled a few fish with by boot clad feet and gently directed them towards the edge of the puddle. I reached down into the finger numbing water and lifted a few of the slimy planktivores back into the river. I walked further up stream and this sycamore caught my eye. 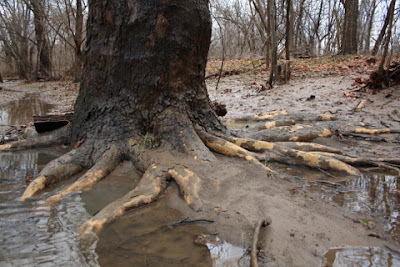 I remember this tree, but don't remember its octopus root system being this far exposed. Sure enough, another dead gizzard shad was laying on top of one of these roots, as if some one had placed it there. Can you see it? I believe it is too small to pick out in this photo, but you could see how the water was rushing around this tree probably only a few hours ago. I'm anxiously awaiting the sun's return here in Columbus. These pictures are just so gray and brown. They are not pleasant. I did see sunlight and blue sky thirty minutes before I took these pictures. But the clouds quickly came back, casting a very flat and dark light on the muddy riverbank. I continue to watch for spring. And I feel that we are "over the hump" of the abdominal snow monster that is winter. Nina from Nature Remains reported that she heard a spring peeper this week. Today, we had two pairs of Canada Geese show up on our complex at work for the first time looking for nest sites. And one of the earliest flowers to bloom along the Olentangy River, a nasty invasive called lesser celandine, has already popped and leafed out. It is not phased by the floodwaters, and this plant did lend a bit of green on this dark, muddy day. Megan and I live in the city. After the water passes our house, the riverine habitat becomes increasingly poor. The trees have been cut away, dams have been built, and by the time the Olentany reaches the Scioto, it is little more than a pond. But here, there are still inconspicuous but important remnants of wild that persist, and this spring and summer, I can't wait to see what the Olentangy will offer up. If you have not subscribed to my blog posts, be sure to do so, and then you'll get word of my photographs and images as soon as I post them here. Spring will be here soon! Looking over a backwater channel of the Olentangy River, with Graceland Shopping Center in the background. Thanks Lana, yep, it will be here. I'm starting to see sings.. The geese were really ripping into each other yesterday at my office complex. 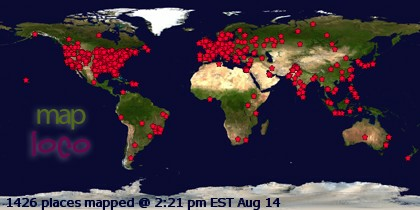 It won't be long before they've set up there territories and will start attacking the employees! Beautiful pictures(I like cloudy pictures! )but I'm sad for the fish. floods, ugg! I guess the crows will be happy with the food that are easy picking to them! Yeah Tom, I was thinking about all the scavengers that would be out gobbling up the dead gizzard shad. I'm guessing the raccoons and opossums had full bellies of fish this evening. Yeah, it was definitely sad. Strangely, I think I would have felt much worse had I seen darters or minnows or even smallies washed up on the shore. I need to remember that all fish are nature's creatures, even gizzard shad!